Never Enough Nails: More China Glaze Sunsationals! The China Glaze Sunsationals polishes were purchased by me. All opinions are my own honest thoughts. Today I have swatches of the other two China Glaze Sunsationals I picked up, Too Yacht To Handle and Keepin' It Teal. 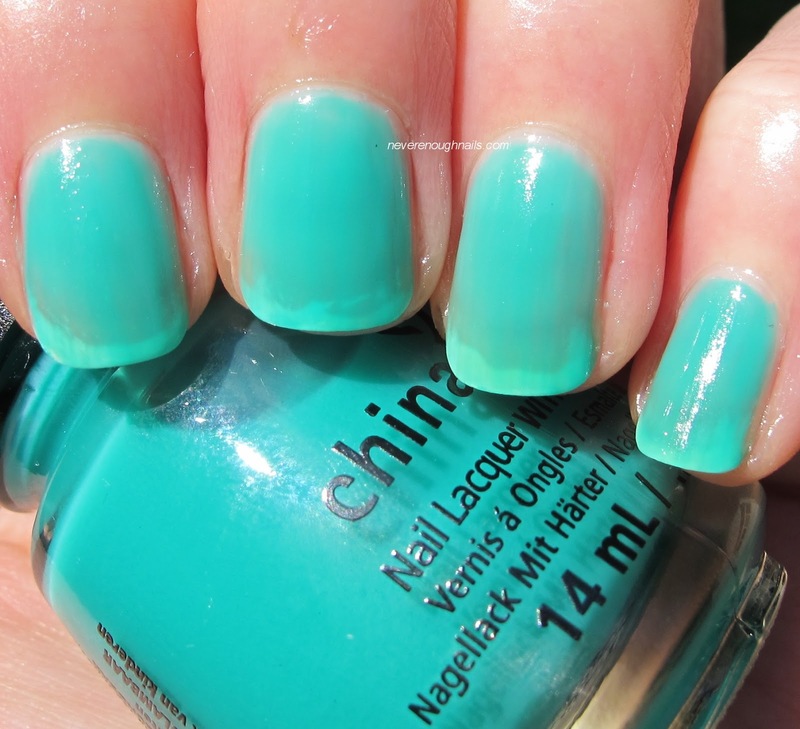 First up, we have the lovely bright blue-green creme, China Glaze Too Yacht To Handle. 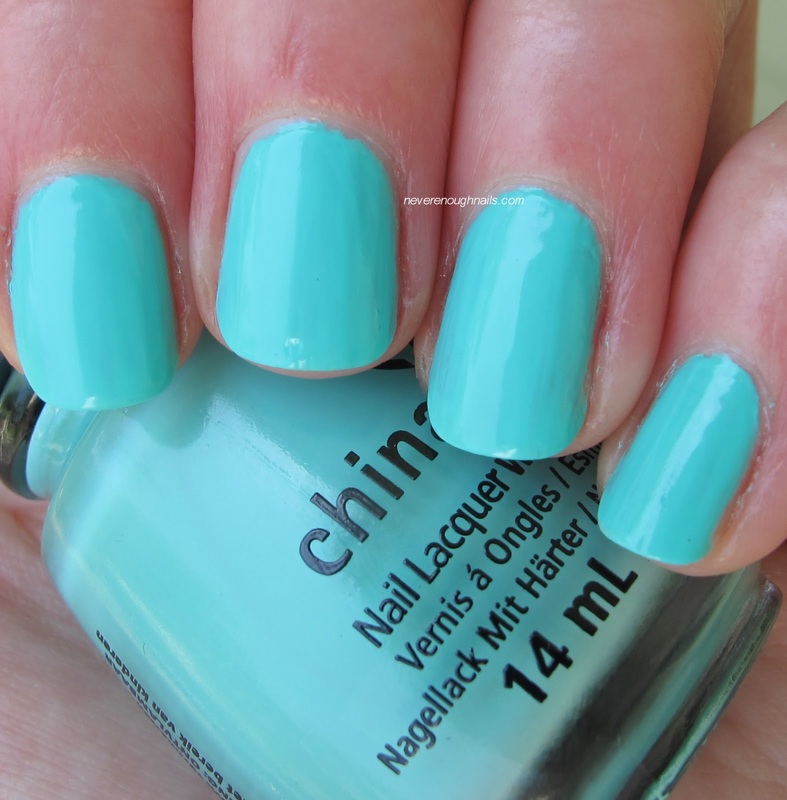 This is a great shade for summer, not quite neon, but definitely bright and cheery. I am a huge sucker for colors like this, so it's no surprise that I love this! Too Yacht To Handle has a pretty good formula. The first coat was a little sheer and streaky, but it was nice and opaque by the second coat, and a third coat evened everything out perfectly. You could most likely just do two coats, but for my catch-every-flaw camera, I did a third. China Glaze Keepin' It Teal is the only jelly I purchased from this collection (so far... I think I want to get Shell-O). This is a very pretty teal jelly that is unique in my collection. I feel like companies tend to do the same colors for jellies all the time, so it's nice to see a couple of different ones! I am not the biggest jelly fan, I only use them for sandwiching. But if you are a jelly fan, Keepin' It Teal is a great one to check out! This is four coats of Keepin' It Teal. I wanted to see how opaque I could get it, but four coats is my limit, haha. The formula was excellent though, it was completely not streaky and applied so beautifully. I can't wait to use this in a sandwich! Overall, I love my picks from the China Glaze Sunsational collection. I think I may have to pick up one or two more of the jellies! If you missed my swatches of That's Shore Bright, Sun of a Peach and Highlight of My Summer, check them out here. The Sunsational collection is available now at salons and Sally Beauty! One last Farewell to Google Reader Giveaway!!! China Glaze Sunsationals Part I! Zoya PixieDust for Fall 2013!! !